Geomaterials such as sands, clay, rock, and concrete are involved in a very large number of engineering applications (geotechnical, structural, petroleum, environmental, etc) and have for this reason been the subject of much research. 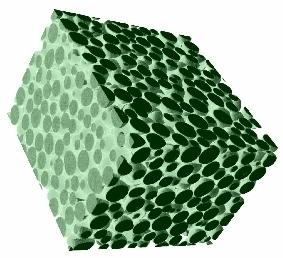 Common to all geomaterials is their porous structure comprising a solid (often called the matrix) permeated by a network of pores which may be filled with a fluid (liquid or gas). The properties of interest usually revolve around their response to mechanical loading and their ability to conduct fluids. Other important aspects include heat conduction, wave propagation and the diffusion of various substances through the pore network. The project aims to determine relevant engineering properties of common geomaterials by simulating the processes that take place on the microscopic scale instead of letting them occur physically as in traditional laboratory experiments. For this purpose detailed information about the microstructure of the material in question is essential. Secondly, in order to derive effective properties, the physical processes that take place on the micro-scale must be simulated. For this purpose various standard and non-standard finite element techniques are used. Many of the processes that govern the effective engineering properties of porous materials take place on the micro-meter scale. As such, detailed information about the microstructure of the material in question is essential. 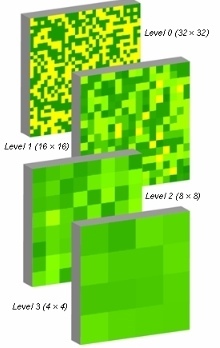 Such information can be obtained using state-of-the-art micro-computed tomography (µCT) techniques which typically offer a resolution of some 1 to 10 µm. All problems are three-dimensional and typically involve several million degrees of freedom. This calls for specialized solution strategies including iterative solvers, grid computing, parallelization, etc. 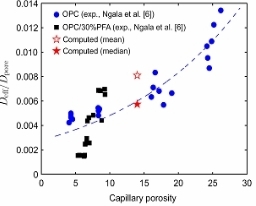 Together with researchers from the University of Hannover, Germany, we have considered the technologically important problem of chloride diffusion in cement pastes. Starting from a mCT scan with a resolution of 1 mm, we were able to derive effective diffusion coefficients. These virtually determined coefficients were in very good agreement with values determined in traditional physical laboratory experiments. 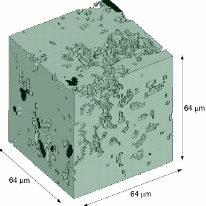 Microstructure of hardened cement paste scanned at a resolution of 1 mm. 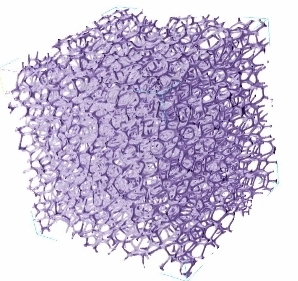 Each voxel ('volume pixel') is represented by an 8-node finite element, giving a total of 643 = 262,144 elements.